In our defense, we had no idea that refrigerators have been breeding with Daleks. All of the inane product warnings about not licking the wire baskets in the freezer are clearly meant to distract from the larger issue at hand. An suspected user error led to the freezer door remaining open overnight. This is simple to fix-the food is still frozen so we’ll just empty the fancy ice maker thing, close the door, and all will be well. Hmmm, still not getting colder, and it’s been an hour. Luckily, the landlord left us the owner’s manual, so we read that in case we’ve missed something. Ah-perhaps it needs to be unplugged for 9 minutes and then plugged back in. Okay! OOh-look, the the temperature has dropped by two degrees. Whew-we didn’t break it! Wait a minute-it’s not getting any colder. Crap. All of the food has melted. We just went to Costco, too! Double crap. Remain calm, call refrigerator manufacturer. Whoops, wrong one. Look up manufacturer website. “Demo Mode”?! DEMO MODE?! This is not funny. If a major appliance has a “mode” in which it is in all other ways operational except for, you know, its primary function, shouldn’t that be in the owner’s manual?! So, to summarize, we have been vanquished by our refrigerator. After simultaneously pushing two little buttons until it beeped, our freezer is back to its normal self. Shiny, but stupid. We have learned that “Demo Mode” is a magical mode in which the refrigerator’s happy temperature display shows the temperature at which the interior ~should~ remain, rather than the actual temperature. After purging the freezer AND the refrigerator, we’re not entirely sure that the food we bought for breakfast will still be good by then. It’s all an adventure. 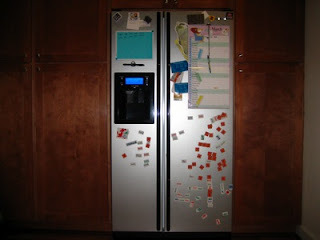 In the mean time, it’s safe to say that Samsung may well make the worst refrigerator EVER. I think this exact same thing just happened to us.....two years after buying the stupid thing. No idea how it put itself into "Demo mode" in the first place, but, two days later it seems to be working after much research online and them pressing two little buttons for 8 seconds. What a stupid feature to put on an appliance and NOT BOTHER TO ADDRESS IN THE MANUAL!!!! AAARGH!! !